Senator Nicholson voted for ALL anti-gun bills that were up for a vote on the Colorado Senate floor. 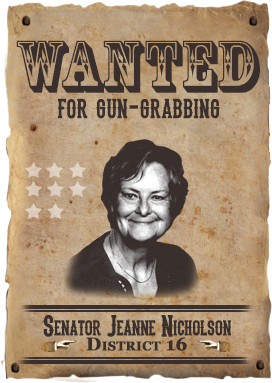 Her seat will be crucial to regaining a pro-gun majority, and you can help RMGO-PAC retire her in 2014! 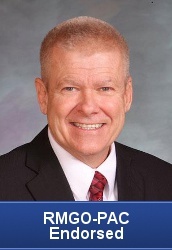 RMGO-PAC is proud to endorse former Senator Tim Neville’s candidacy against Senator Jeanne Nicholson in District 16. During Tim’s previous term in the Senate, he was RMGO’s HIGHEST RATED State Senator. He is a proven protector of the Second Amendment and is sorely missed! While RMGO-PAC has already donated the maximum allowed by law to his campaign, you can help send him back to the Capitol by donating directly to his campaign. In the coming weeks and months leading up to the 2014 Elections, RMGO-PAC will be announcing more candidates running against the gun-grabbers that you can support. Make sure you stay tuned!